In fact, Sheridan had been so focused on Akina’s contact request and her exciting second cousin match that she’d totally missed the match a few rows down listing “Brian Killoran” as her potential fourth cousin! She and Brian had grown up together and their parents were still good friends. Sheridan thinks it’s wonderfully ironic given that she’d considered the Killorans as much family as her own. It’s also quite fortuitous because Brian recently developed an interest in genealogy and could show her a bit of what he’s learned. With his help, she might just find out who their shared ancestor was. Jan 2013 – Editor’s note: Ancestry Finder is now known as Countries of Ancestry. Ancestry Labs is sometimes known as Ancestry Tools. Family Inheritance is sometimes known as Family Traits. This post has been updated to reflect these changes. Certain images of Relative Finder may be out of date as this story was created prior to Relative Finder’s Summer 2011 update. Sheridan calls Brian up and they agree to meet at the coffee shop down the street. Once there, they set up their laptops side by side and log in to their individual accounts. Brian asks if she’s checked out any of the Ancestry Labs, but aside from reading about the Haplogroup Tree Mutation Mapper (see Sheridan’s introduction to haplogroups), she hasn’t. He clicks on Ancestry Tools > Countries of Ancestry in his account and shows Sheridan. “But how does it know where people’s grandparents were born?” Sheridan asks. Brian clicks on a link near the top that says “see how this works” and a detailed description appears. “Ah,” she says, reading the first paragraph, “So Countries of Ancestry matches are actually Relative Finder matches, and the country information comes from people’s responses to the ‘Where Are You From?’ survey.” She falls quiet for a moment, eyes lingering wistfully over those words. Brian gives her a gentle nudge. Eager to see what her own Ancestry Finder shows, Sheridan opens hers up, but to her disappointment, she only sees a handful of colored bars. “I usually change the settings to show the most matches. Try changing some of yours,” he suggests, pointing to the area under “Advanced Controls”. She drags down the minimum segment size and chooses a smaller minimum number of grandparents, and her chromosomes immediately light up with a rainbow of colors. Her chromosomes fill up almost completely with blue colored bars. He moves the minimum number of grandparents back up to four. Almost all of the colored bars vanish. Of the ones that remain, Brian drags the mouse over to a strip of four pinkish-red colored bars on chromosome 10. “This is probably me,” he says. The screen shows another view of the 23 pairs of chromosomes. Brian selects Sheridan’s name from a drop-down list of his shares and a bright blue strip representing a half-identical region of DNA appears on chromosome 20. “So I guess that means I’m actually those pink bars on chromosome 20!” he says. Sheridan is impressed at this level of detail, but still wondering if they can figure out their ancestral connection. For that, Brian says, they’ll need to go hunting the old-fashioned way. Although his own parents weren’t born in the United States, he knows that some of his ancestors immigrated here in the late 1800’s and he’s been collecting whatever historical records he can find. They decide to meet up again in a few days after he’s looked through his files. She finishes her coffee and bids goodbye to Brian. She can’t wait to see what they can figure out at their next meeting. Other posts in this series: What Can You Learn? 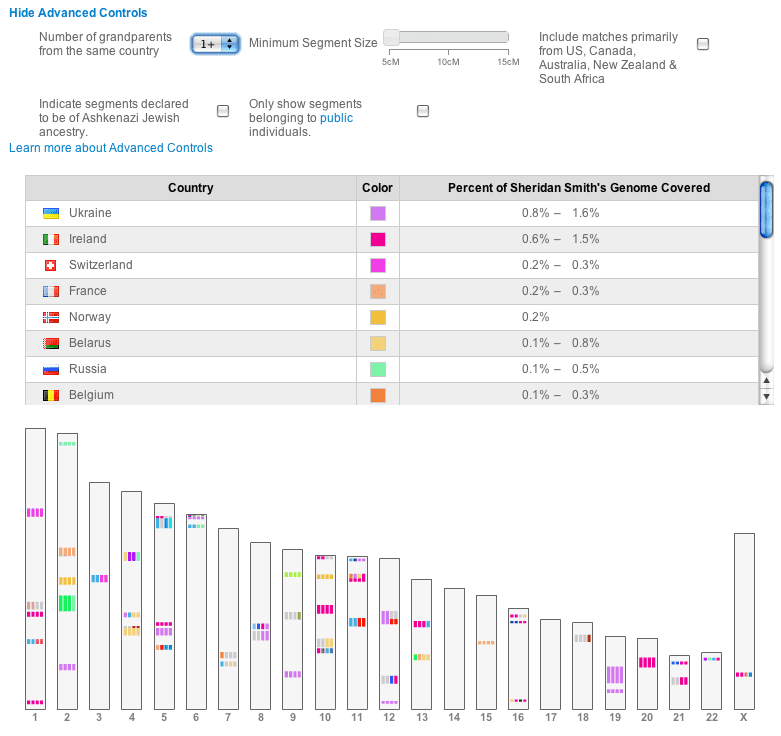 – An overview of 23andMe’s ancestry features. Introducing Sheridan – We meet Sheridan and she learns about her maternal haplogroups. Sheridan’s Global Origins – Sheridan compares herself and her friends to various populations around the world. 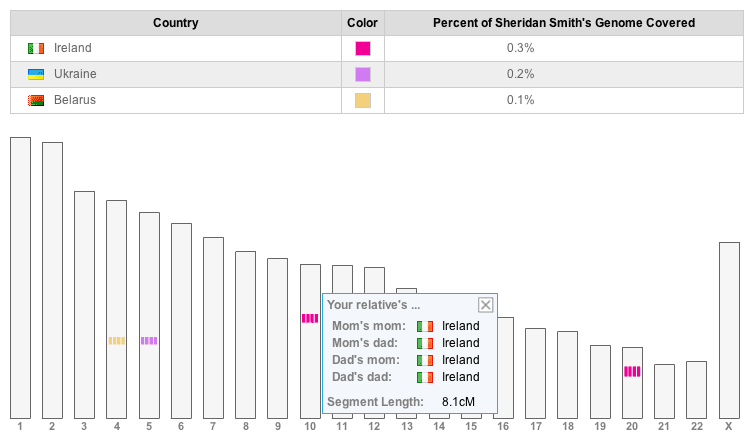 Sheridan’s Got Relatives – Sheridan responds to a fifth cousin and discovers a predicted second cousin in the 23andMe database. (next) Old Roots and New Horizons – Sheridan and Brian put together the pieces to sketch out their shared family tree.